IMAGE: File photo of American heavyweight boxer Cassius Clay (later Muhammad Ali), February 1964. Photograph: Getty Images. Words of wisdom by someone simply nicknamed 'The Greatest'. 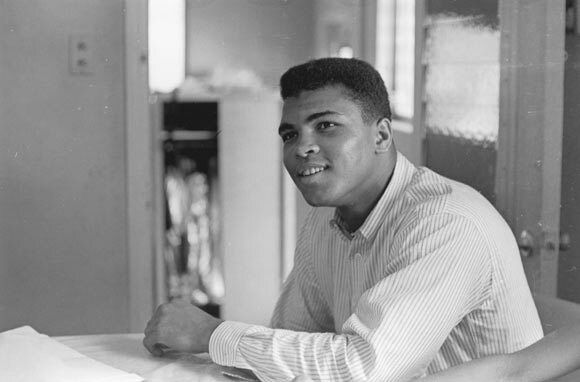 On January 17, 1942, he was born in Louisville (Kentucky), and named Cassius Marcellus Clay, Jr. He went on to be addressed by that title for 22 years of his life. Now, as the world mourns his passing away (aged 74), he is known to all as Muhammad Ali, the legendary boxer whose record is, to put it in one word, impeccable. As a professional he fought a total of 61 fights, winning 56 of them (37 by knock-outs). 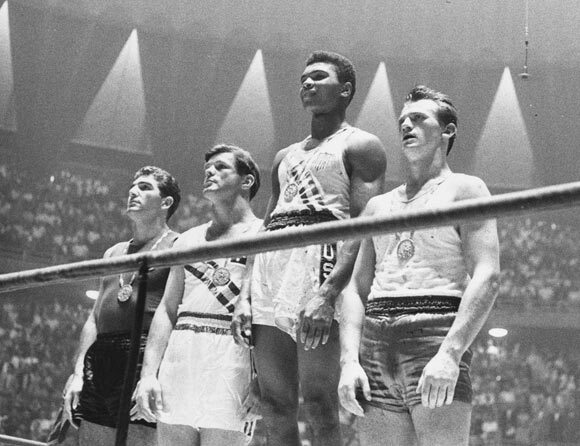 IMAGE: The winners of the 1960 Olympic medals for light heavyweight boxing on the winners' podium at Rome: Cassius Clay (now Muhammad Ali) (C), gold; Zbigniew Pietrzykowski of Poland (R), silver; and Giulio Saraudi (Italy) and Anthony Madigan (Australia), joint bronze. Photograph: Getty Images. A boxer renowned for his speed and swift footwork, Ali described his fighting style as "float like a butterfly, sting like a bee', one that ensured him three world heavyweight titles. Having started boxing at the age of 12, Ali's amateur career was impressive -- one that saw him win 100 fights while dropping just five. Among the plethora of titles he won in the period was the gold medal in the light-heavyweight category in the 1960 Summer Olympics in Rome. While his win was expectedly straightforward, he couldn't keep the gold medal for long, throwing it into the Ohio river after being refused service at a 'whites-only' restaurant, a fact he later mentioned in his 1975 autobiography. Even as Atlanta hosted the Centennial Games in 1996, in two of the most memorable moments, Ali was requested to light the torch to start the Games and was subsequently given a replacement gold medal, during a half-time ceremony of the basketball game between the United States and Yugoslavia, at the Georgia Dome. 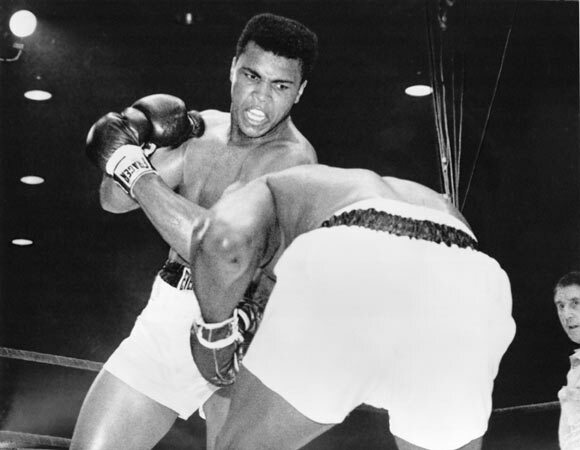 IMAGE: Muhammad Ali in action against Sonny Liston during their heavyweight title fight at Miami. He won when Liston failed to come out in the seventh round. Photograph: Getty Images. A vindicated Ali, shouting at reporters who had dismissed him before his world title fight with Sonny Liston in Miami, in February 1964. Liston was the reigning world heavyweight champion, having bested Floyd Patterson in 1962. Ali (then called by his original name) wasn't expected to defeat the champ, although he had an impressive record. However, an upset was on the cards, as Ali got on top of a visibly inebriated Liston early on. As the contest entered the fifth round the younger boxer was dominating. Then, to the dismay of all, Liston failed to answer the bell for the seventh round, stating he had a shoulder injury. Ali, rather Cassius Clay, at 22, had become the youngest boxer ever to take the world heavyweight title from a reigning champion -- a record he held for 22 years before Mike Tyson bested Trevor Berbick in 1986. 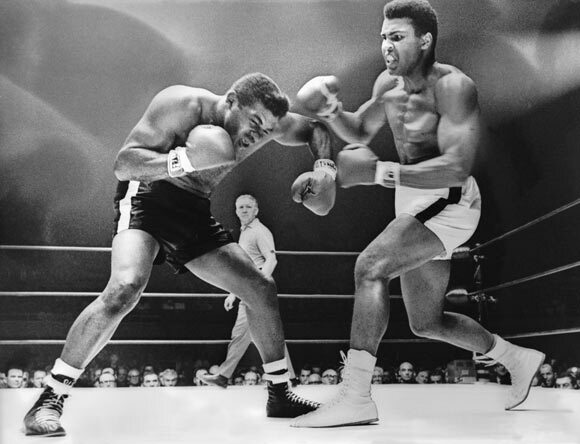 A year later, a rematch was held in Lewiston (Maine) and Ali knocked out Liston in the first round with something that later became famous as the 'phantom punch'. 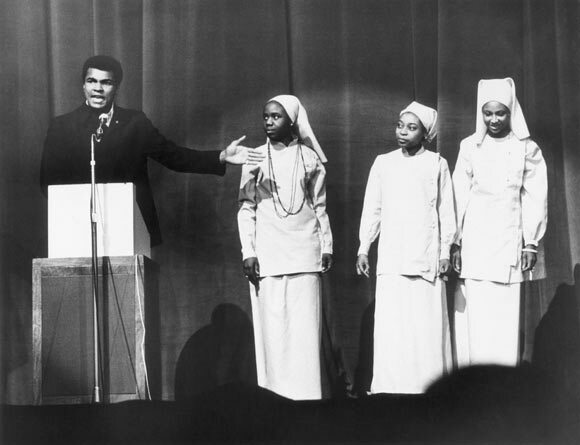 IMAGE: Muhammad Ali addressing a Nation of Islam meeting in London in December 1974. Photograph: Getty Images. 'I'm a Muslim. I've been a Muslim for 20 years... You know me. I'm a boxer. I've been called the greatest. People recognize me for being a boxer and a man of truth. About a month after beating Liston for the world title, Clay had joined the Nation of Islam, the latter giving him the name Cassius X.
Clay was soon named Muhammad Ali, the adoped name symbolizing his new identity. About 11 years later, Ali became a staunch Sunni, before turning to Sufism. IMAGE: Muhammad Ali spars with challenger Floyd Patterson during the World Heavyweight Championship fight. Clay won the fight with a technical knockout in the 12th round in November 1965. Photograph: Getty Images. Of all the men I fought, Sonny Liston was the scariest, George Foreman was the most powerful, Joe Frazier was the roughest and toughest and Floyd Patterson was the most skilled as a boxer." In November 1965, Floyd Patterson was Ali's opponent in what was the latter's second title defence. The two boxers weren't exactly in good terms. 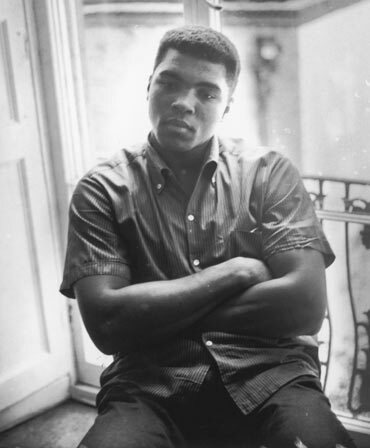 Ali, seven years younger to Patterson, called him 'Uncle Tom', as the latter refused to call him by his name, instead continuing to address him as Cassius Clay. Patterson was attempting to be the first to win the heavyweight title three times. However, he was humiliated by his young opponent, losing by technical knock-out after the completion of 12 rounds. 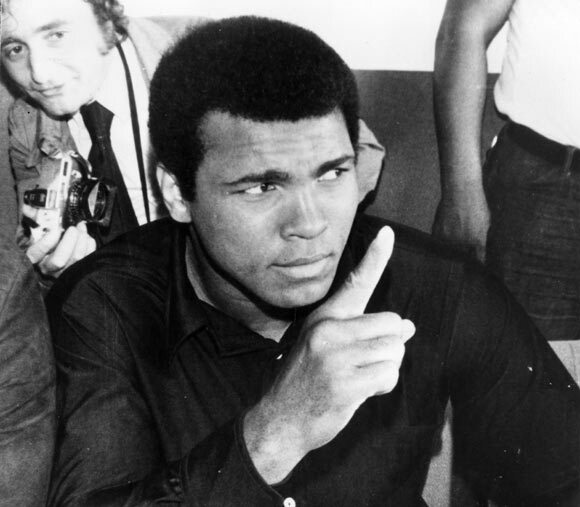 It was alleged that Ali, instead of scoring a quick knock-out, had mocked, humiliated and punished Patterson throughout the fight, a charge that the champion vehemently refuted. IMAGE: A file photo of Muhammad Ali, dated 4th August 1966. Photograph: Getty Images. If Ali's fights were controversial, so were his actions away from the ring. His religious beliefs -- he had only recently converted to Islam -- ensured he refused to be conscripted into the United States army during the Vietnam war. His reasoning for the same inspired an otherwise reluctant Martin Luther King Jr. to voice his opinion against the actions of the Lyndon Johnson administration. Ali was vilified for his refusal and subsequently arrested (albeit not imprisoned). He was found guilty on draft evasion charges and was stripped of his boxing title. Moreover, his license was suspended, meaning he couldn't fight for about four years. IMAGE: In a fight at Madison Square Gardens in 1971, Ali goes down in the 15th round to a left hook from heavyweight champ Joe Frazier who kept the title. Photograph: Getty Images. Held at the Madison Square Garden in New York in March 1971, it was called the Fight of the Century. Both the boxers had impressive records. 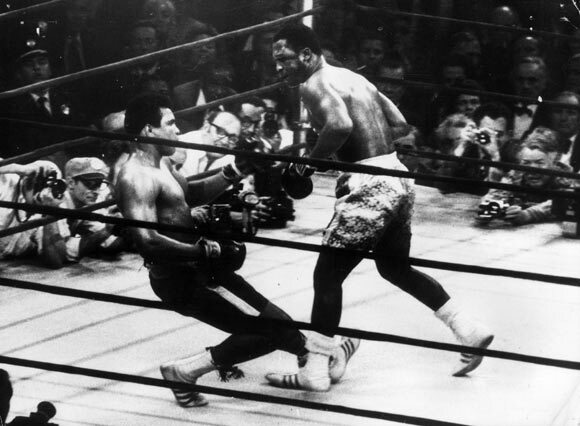 While reigning champion Joe Frazier had not lost in 26 fights (23 of them knock-out decisions), Ali also boasted of an unbeaten record in 31 fights, (including 25 knock-outs). However, it was Frazier who would rule the day. A spectacular left hook from him early in the 15th round, put Ali on his back. And though the latter got up, Frazier continued his assault, going onto retain his title with a unanimous decision. It was Ali's his first professional loss, a crushing one at that. Four years later, the two boxers were involved in the Thrilla in Manila, the third and final face-off between them. The bout lasted 14 rounds before Ali was declared the winner. IMAGE: American heavyweight boxer Muhammad Ali addressing the press at Kinshasa where he is preparing for his fight against world champion, George Foreman. Photograph: Getty Images. Ali regained the world title he was stripped off seven years later, against George Foreman. The fight, held in Kinshasa (Zaire), on October 30, 1974, was billed as The Rumble in the Jungle. Foreman had everything going for him. Coming into the bout, he had won 37 of his 40 fights by knock-out and had knocked down Joe Frazier an incredible six times. However, in one of the biggest upsets in the history of the sport, Ali regained his title, winning the high-profile contest in the eighth round. 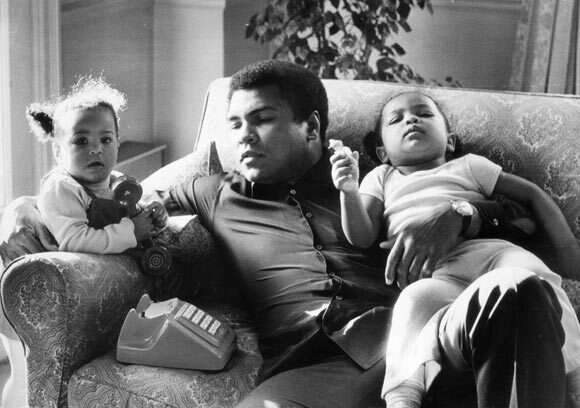 IMAGE: Heavyweight boxer Muhammad Ali with his daughters Laila and Hanna at Grosvenor House in December 1978. Photograph: Getty Images. In 1980, a 38-year-old Ali challenged reigning champion Larry Holmes in an attempt to win a heavyweight title an unprecedented four times. The veteran went on to lose the fight, throwing in the towel after the 10th round. Four years later, Ali was officially diagnosed with Parkinson's Disease, prompting many to opine that it was his inability to give up the sport that led to decline in health. He kept a low profile in recent years. Ali married four times and has seven daughters and two sons. Laila Ali, his daughter from the third marriage, is a retired professional boxer. Despite being away from the limelight in recent years, the legacy of Ali continues to impress his many fans. He is a cultural icon. Among the many tributes, the 2001 biopic, Ali, directed by Michael Mann, garnered an Oscar nomination for Will Smith, who played the title role.